Silage clamps are so often hidden away and neglected, and yet they are vital part of every agricultural biogas plant. The storage of forage stocks (silage) is vital for those times in every year when AD feedstocks are in short supply from other sources. Undoubtedly, the average farm business should pay them more attention, especially since should they leak they have the potential to cause significant watercourse pollution, which can lead to action from the environmental regulator. If a silage clamp pollution incident occurs, the polluter pays principle will mean that the farm/ biogas plant operator will end-up paying all the fees incurred by the regulator (Environment Agency – UK) investigating the incident, even if no prosecution occurs. There are now three recognized types of clamp wall, these being vertical and sloping walls, in addition to a simple flat-pad clamp. 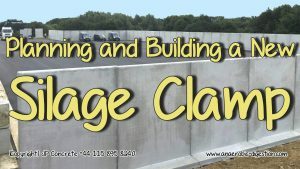 Until recently nearly all large silage clamps of a sufficient scale which required formally designing were essentially vertical walled (using pre-cast concrete panels or cast-in-situ vertical walls) and the government guidance provides examples. JP Concrete’s panels were resin-anchored for added stability to a reinforced concrete foundation. Where silage was to be stored to any height against external walls the practice was to allow any liquid escaping (leachate) to run through these walls. Where this occurs, provision has normally been provided for this leachate to be collected in perimeter drainage channels and drained to a low point with suitable storage until this contaminated water could be pumped out and disposed of responsibly. In the last few years, the scale of new silage clamps has increased such that silage clamp construction has become a specialist skill. External contractors are brought-in and for all but the flattest sites they require significant earthworks/ earthmoving. By adopting a “balanced” earthworks design the visual impact of the clamp can frequently be minimized, by reducing the level of the silage clamp base so that the excavated material can be used to create sloping earth-bund walls around low parts of the clamp, and elsewhere (where the clamp is cut into then ground), a stable self-supporting sloping wall is created. By doing this silage clamp costs are minimized due to the fact that the concrete walls (precast or in-situ cast) can be laid against the sloping earth faces to provide physical protection to the outer bund containment. This is usually done at a lesser thickness and requiring less reinforcement than for the equivalent vertical walls. Nowadays, an initial decision when planning a silage clamp is the choice of vertical, or sloping walls. Many farm businesses will seek prices from silage clamp contractors for both vertical and sloping wall designs, in order to test the market. Flat-pad silage clamps can be very cost effective, requiring no more than a concrete or asphalt base. However, more space is required to store the same amount of silage as it is not restricted by outer walls, which can also make it difficult to achieve desirable compaction. The sides of the silage on a flat-pad clamp can become very steep, making it difficult to cover and make an airtight seal over the silage, however solutions are available. Silage clamp capacity is maximized because compaction can be carried out right up to the clamp edge. This can also reduce the potential for shoulder wastage. Reduced risk of plant damage to walls: Occasionally compaction activities can overrun, hit, and damage vertical walls with the risk of walls giving way. Sloping walls in contrast simply tend to lift any machine which touches them, and in that way shrug-off damage. Operative Safety: Earth banks / sloping walls don’t present the same risk of falling as the vertical edge does to staff during sheeting-down work. Space for sheet storage and sheeting ballast (tyres or gravel bags) is usually available on the banks reducing the need to lift materials up a height when covering the silage. Choice of contractors: Companies supplying and erecting vertical walls tend to be more common than for sloping silage clamp walls. Ease of inspection for leachate leakage: Handling leachate for vertical walls is visible, enabling any build-up or blockages to be easily identified and rectified. You must follow the following rules given in the regulations extract (this is not a comprehensive summary) if you store silage, slurry or agricultural fuel oil. You need to know the general rules that apply if you store any of the 3 substances, as well as specific rules for storing and handling each one. You can be prosecuted and fined up to £5,000 in a magistrates’ court, or get an unlimited fine in the Crown Court, if you don’t follow the rules and take care to avoid causing pollution. Although your store itself must be at least 10 metres clear of inland or coastal waters, drains and sealed pipes can be within 10 metres of these features if the Environment Agency agrees an exception. Ask for an exception when you tell the Environment Agency about your project. If your installation was built before March 1991, or a contract for construction was entered into before March 1991 and completed before September 1991, it’s exempt from the rules for new stores. However, if you make substantial changes – for example structural changes, increasing capacity or relocating – your store is no longer exempt. The Environment Agency can also serve a notice at any time requiring you to bring storage up to the current standards if it believes there’s a significant risk of pollution. Once your storage is built you must carry out maintenance to make sure there’s no risk of pollution. The design criteria for silo walling in the UK has been used for the least 20 years and is set out in BS 5502 part 22. This is now becoming out-dated since the upper limit given for compacting vehicle weight is 10 tonnes. Today’s silage clamp contractors are regularly using industrial loading shovels for filling and compacting clamps and these regularly exceed 20 tonnes. It is clear that the BSI code is not suitable to give us the design information we need. As a result ACP (Concrete) Ltd has been utilizing a North American code to overcome this issue. The loads generated in clamps with high walls and high compaction loads are massive. Traditional methods of wall construction cannot be adapted to suit these pressures so ACP have designed an entirely new product range using a 280mm pre-stressed panel. The enormous leap in unit load capacity offered by these panels has been achieved whilst still retaining all the economic and practical benefits of using prestressed wall panels. The rapid construction and relatively slender section of pre-stressed concrete wall panels have been appreciated by livestock farmers for the last 30 years, now the requirements of the AD plant operator can also be met by these new 280mm panels. Full planning is required if the silage clamp is over 465 sq metres (5005 sq feet) or you are installing effluent storage. If below 465 sq metres (5005 sq feet) a prior notifications will normally be required see planning guidelines. If its not a prior notification full planning is required. All silage clamps require an engineer to certify the design. This requires you to notify the local environment agency office 14 days before intended use in England and Wales. 28 days in Scotland & Northern Ireland. 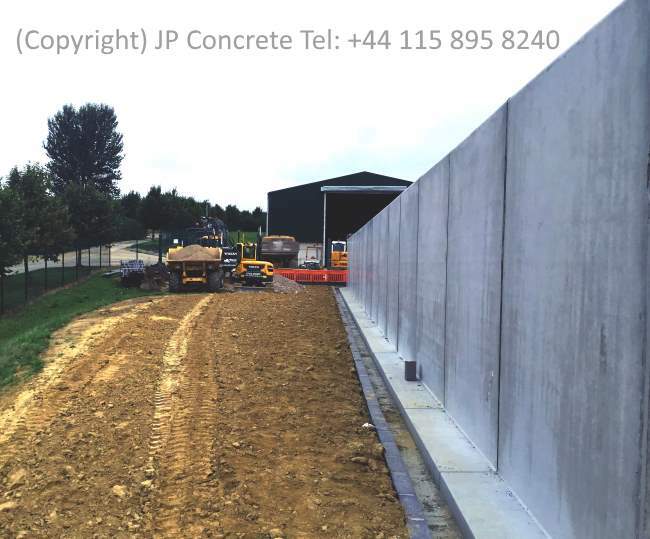 JP Concrete has completed the supply and installation of high-quality pre-cast concrete panels for a silage clamp at a new farm-based AD/biogas plant in Somerset. Working closely together with David Civil Engineering, who wanted panels with a very high finish for their customer, Sustainable Energy Generation, a total of 73 panels (316/250 AGRI L) have created a clamp that will house arable crops, growing grass, cereals, maize and fodder beet from the 320ha Frogmary Green Farm. “The leachate from storing this type of material can be very detrimental to concrete”, said Shane David, Director at David Civil Engineering. “We searched long and hard for a product that had a suitably hard surface and a very high standard of finish – with JP Concrete able to not only supply but install too. With cheaper panels you can get twists and misalignments where the surface isn’t sufficiently tight, but the panels from JP Concrete are first-class for an AD silage clamp”. 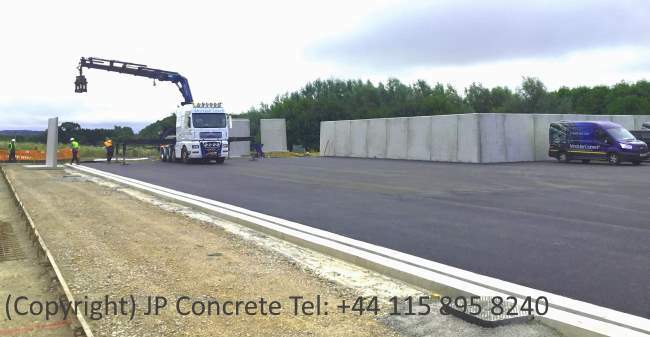 In creating 182.5m of wall to maximise the storage space for Sustainable Energy Generation, the pre-cast JP Concrete panels were resin-anchored for added stability to a reinforced concrete foundation poured by David Civil Engineering, who also then laid an asphalt surface over the top. 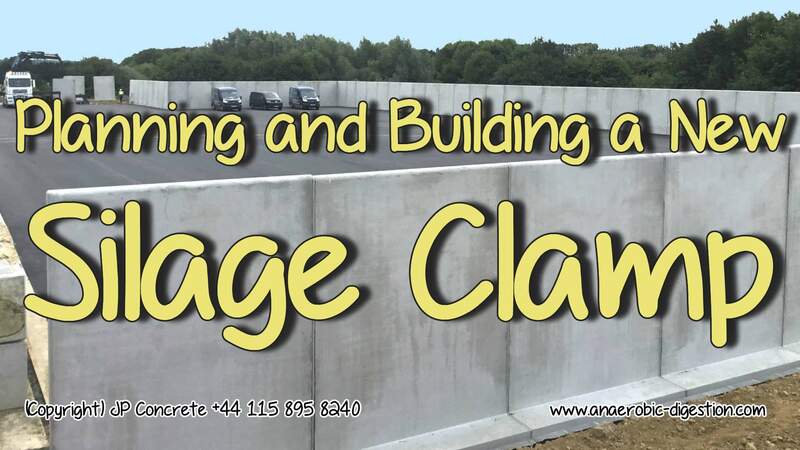 Creating a silage clamp which will provide a robust and structural solution to the storage of silage waste is possible with … concrete retaining wall products. Good clamp management is the essential factor to achieve good quality silage. This begins with the side walls. In walls where the concrete has cracked, air can get in creating waste at the shoulders. Interlocking and connecting systems can provide a secure area to store silage. The connecting units can be sealed to reduce the air surrounding the silage which will improve the nutritional quality and palatability of the product. In order to provide a safe and secure silage clamp, particularly when under the pressure of being rolled, … concrete units that can be bolted down or cast in, give … the security that the wall will withstand the pressure. Charles Foster, of insurance broker Lycetts, said farmers must be aware of the potential environmental risks this summer while making winter animal fodder from grass and maize crops, by fermenting them into silage in plastic-covered clamps. Mr Foster, who is based at the firm’s Norfolk office in Fakenham, fears too many farmers haven’t checked their silage clamps are airtight and leach-free because they aren’t fully aware of the dangers of poor silage storage. He said if effluent gets into waterways it can have a devastating impact on fish, wildlife and ecosystems as it could be up to 200 times more toxic than untreated sewage. “Silage effluent is extraordinarily toxic – so the damage it can cause to watercourse eco-systems is profound,” he said. “Once the effluent is in the ground and reaches a watercourse, it is very difficult to contain and it can find its way into springs, wells and boreholes and public water supplies which will require immediate action by an Environment Agency-approved contractor. The base of the clamp should extend beyond any perimeter wall at the perimeter to the clamp there should be a drain that collects the effluent and channels that lead to your effluent storage tank. How do you get a farmer to stop these clamps smelling. Do they have to be so awful?